I was searching for Running Comics and found the two above.. Thought they were pretty cute... Website HERE. 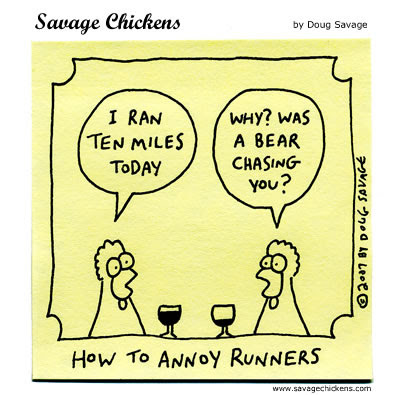 The First comic made me think..... What are some responses you get from non-runners when you tell them how far you ran?? Share your conversations in a comment..
My normal reply I receive is: "you are crazy". I get "you're crazy" all the time, too. My husband always jokes that he only runs when chased, then laughs and looks at me. What, buddy? When the zombies attack I can outrun them AND you. I get a lot of "I could never do that" but nothing too negative. I got much more interesting reactions when I told people that I do kung fu and that bruise on my arm is from sparring. My husband will sometimes ask "did you run the whole way?" which drives me CRAZY because I'm doing the Galloway method. There's nothing wrong with walk breaks! You're crazy, I could never do that, WHY?? The thing is, I know that I've said those same things to my running friends before I started running, right up there with "Why are you running 26.2 miles when you know you aren't going to win?" I get it now, and either they will some day or won't. Regardless, I love being able to do things that others--and I--wouldn't have believed I could, so I enjoy the reactions. The one I like most is: "I don't even like to drive that far!" Since I posted on FB my disappointment in my weekend run I have been getting lots of flack. Like really, only 11 miles...seriously. Who says that...and who would want to go two more?? I get tired just thinking of it! How far is that marathon you did again? Your joints will get damaged from all of that pounding. Wow - you are hooked aren't you? The strangest response I ever got was : "For you it's easy - you've got long legs." "why" is definitely the most common response. The best I've ever heard is, "running is 60% physical, 40% mental and 100% stupid. run all you want idiot." That was said in a joking way by a friend. I get from my BF- "God bless ya! I sure couldn't do that" Which I then get into the speel that yes you can etc. I always got "way to go!" about posting mileage on FB, but this is from runner friends. The others just ignore it I guess. My husband thinks the mileage is nuts. 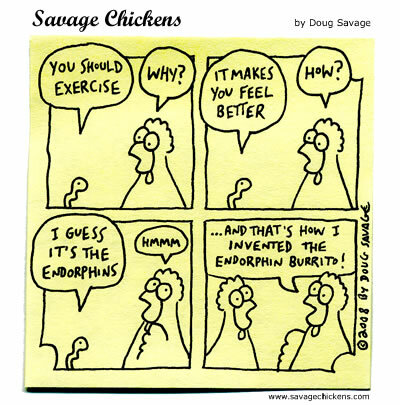 Where can I get one of those endorphin burritos? Sounds tasty! I just asked my best friend if she wanted to do a warrior dash with me. She responded "Hell no! Why would I pay that much money to run when I could do it for free?" Which is interesting because she pays for a gym membership. After explaining DailyMile to a friend she said, "So you can actually lie about your mileage?". . I'm like, "I. . guess. . . but you're only cheating yourself." Then I thought to myself. . "wonder if she thinks I'm lying about the miles I run???" I usually get,"That's far to drive and you run it?" i usually get "good for you" or " i don't think i drove that far today"! i just give a small shrug and a small smile and move on. if they don't get it by now...then they're crazy! and you wanted to??? and didnt die??? 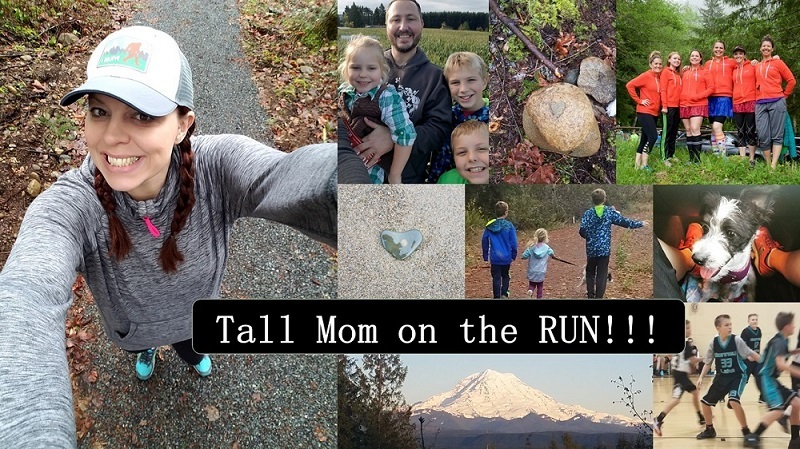 I usually get the "you are crazy" or "I could never do that"
My dad used to always roll his eyes and say, "I am only going to run if someone is chasing me with a shotgun." Then he came to my second half marathon and had the best time going with my husband to the different mile markers and the finish. He will never be a runner, but he doesn't say a negative word about my running any more! I love the jokes about "what were you running from?" On the course for last October's Half, there was a sign that said "I don't get it. What are you all running from?" and I couldn't help but crack up! My favorite response to how much I've ran (swam, biked, or worked out) is "...are you ok?" like I'm trying to punish myself. Thanks for the comics. Great finds! I get a lot of "Wow! ", "You're crazy! ", or "I could never do that!" I also get asked "Why would you do that? ", too, along with the classic, "Wow, I would only make it (insert short distance here)," or they inform me that they would, in fact, die if they attempted the same thing, or how many days/weeks/months it would take them to do it. Haha loved these. Normally I hear how crazy I am or, or why would I want to run that far. I just tell them its not for everyone!